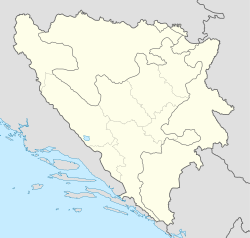 Lukomir is a village in Konjic municipality, in Bosnia and Herzegovina. It consists of two settlements: Donji (Lower) and Gornji (Upper) Lukomir. Gornji Lukomir is more significant and famous for its touristic potential and heritage, and it's a highest in altitude and most remote village in the entire country. Lukomir sits at an altitude of 1,495 m on the Bjelašnica mountain. Stećci originating from the 14th and 15th century exist at the village and suggest that it was inhabited for hundreds of years. The homes in the area are made of stone while their roofs are composed of wooden tiles. The Rakitnica canyon is located nearby and is said to be the origin of a dragon by local folklore. Considered significant in terms of quality of natural and cultural-historical landscape, Lukomir (Gornji Lukomir) village and its immediate surrounding is designated as National Monument of Bosnia and Herzegovina. Donji Lukomir (Lower Lukomir), situated at cca 1000m a.s.l. Donji Lukomir (Lower Lukomir) is part of the village situated some 500 meters below Gornji (Upper), on the steep slopes of the Rakitnica canyon. A documentary entitled "Lukomir - Six Months Off" (Dutch: Winterslaap in Lukomir) directed by Niels van Koevorden was filmed in 2010. It was screened at the Netherlands Film Festival. It later won the 2010 Documentary Award from Dutch broadcaster VPRO. ^ Bangs, Richard (16 September 2009). "Bosnia: a model for the planet". MSNBC. ^ Huseinović, Samir (24 August 2008). "Turizam ni na nebu ni na zemlji". Deutsche Welle (in Serbo-Croatian). ^ Šolić, Tomislav. "Posljednja planinska sela Bjelašnice" (in Serbo-Croatian). National Geographic. ^ "Lukomir, cultural landscape - Commission to preserve national monuments". Lukomir-old.kons.gov.ba. 2009. Retrieved 31 May 2018. ^ "Winterslaap in Lukomir". Netherlands Film Festival. ^ Sunje, Aida (19 July 2010). "Award Winning Film on Lukomir to Be Screened in Bosnian Village". Balkan Insight. Wikimedia Commons has media related to Lukomir (Konjic). For official site names and detailed informations, see each article or the List of National Monuments of Bosnia and Herzegovina. This Bosnia and Herzegovina geography article is a stub. You can help Wikipedia by expanding it. This page was last edited on 5 December 2018, at 16:09 (UTC).